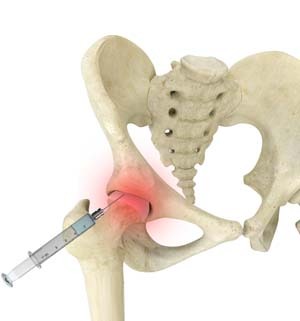 Hip joint injections involve injecting medicine directly into the hip joint to diagnose the source of pain or to treat pain due to conditions such as arthritis, injury or mechanical stress of the hip joint. Hip pain may be experienced in the hip, buttock, leg or low back. The injection contains a combination of a numbing medicine and cortisone (an anti-inflammatory agent). Numbing medicine delivers temporary relief from pain, provided the hip joint is the source of the pain. It thus serves a diagnostic function and helps to confirm or deny whether the joint is the source of pain. Cortisone serves to reduce the inflammation in the joint providing long term pain benefit. If needed, a relaxation medicine is given to the patient through an IV line. The patient lies face down on an X-ray table. The small area where the injection needs to be given is numbed with an anesthetic. The patient may feel a sting for a few seconds. A small needle is then accurately placed by the doctor into the joint guided by the real-time X-ray images (fluoroscopy). Before injecting the medicine, a contrast dye is injected through this needle into the joint to confirm that the medicine will reach the joint. A combination of anesthetic and anti-inflammatory cortisone is then slowly injected into the joint. The whole procedure usually takes about 30 to 60 minutes. After the injection, the patient is instructed to rest for 20 to 30 minutes and is then asked to move the joint, provoking pain. The patient may or may not find a decrease in pain depending on whether the injected joint is the main source of the pain. The patient is also asked to maintain a record of relief in pain during the coming week. Physical therapy may also be recommended. Even when pain relief is significant the patient should increase activities gradually over one to two weeks to avoid reappearance of the pain.